What a sharp and handsome bobby suit/Jon Jon perfect for formal occasions when he needs to be dressed to impress! 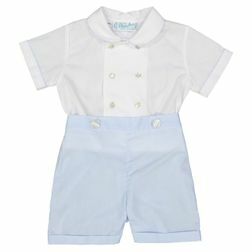 This little boys outfit features a white double breasted top with dainty piping along the collar and sleeve cuffs. It buttons to light blue shorts. Perfect for Easter and portraits too! It is made of 65% polyester and 35% cotton.